Go on a day trip to Kuala Terengganu and view the coastal area where scores of Malay and fishing villages can be seen. Stop by the Batik center and learn about traditional printing methods. 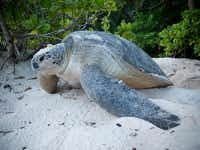 Visit the turtle sanctuary and learn about their conservation and protection. Afterwards visit Karyaneka center to buy some local handicrafts. Finish your tour with a trip to the local market and bargain away to your hearts content!